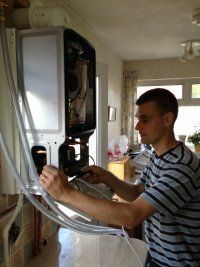 Do you need a local Boiler Installer Leicester Based? Want to Upgrade your system to the most energy efficient? Give us a call today and arrange a no obligation free quotation. We can Match the Boiler Warranty which is backed by the Boiler Manufacturers so even if we were to go out of business, The Manufacturer (Worcester, Baxi etc.) will carry out repairs for free! We carry out boiler swaps where we replace the boiler in the same location. We Install complete central heating systems, Change Systems to Combi Boilers Leicester and Leicestershire. "How Much would it cost to Replace combi boilers leicester?" Is a very common Question we hear. The Best way to get an accurate answer is to give us a call and arrange a free no obligation quotation.